Controlled natural languages (CNLs) are based on natural language and apply restrictions on vocabulary, grammar, and/or semantics. They fall broadly into 3 groups. Some are designed to improve communication for non-native speakers of the respective natural language; in others, the restrictions are to facilitate the use of computers to analyze texts, for example, to improve computer-aided translation; and a third group of CNLs are designed to enable reliable automated reasoning and formal knowledge representation from seemingly natural texts. 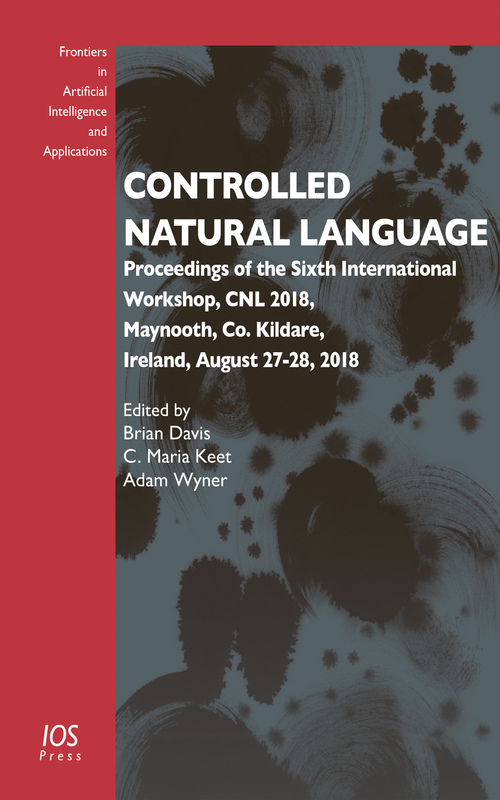 This book presents the 11 papers, selected from 14 submitted, and delivered at the sixth in the series of workshops on Controlled Natural Language, (CNL 2018), held in Maynooth, Ireland, in August 2018. The papers cover a full spectrum of controlled natural languages, ranging from human oriented to machine-processable controlled languages and from more theoretical results to interfaces, reasoning engines, and the real-life application of CNLs. The book will be of interest to all those working with controlled natural language, whatever their approach. Editors: Davis, B., Keet, C.M., Wyner, A.